purplecats corner: A purple Angel, peonies and a long lost cousin! Did that get your attention?? well first is my new painting "Purple Angel", then a photo of some peony flowers I treated myself to, they are my favourite flowers, I love how they are layer upon layer of tissue like petals. I have some in my garden, but not enough flowers yet to pick.#The long lost cousin is my Grandads cousin from Australia, who after 25 years of family history research we found a few years ago, the funny thing is that she was looking for us all that time too. She has come to England , and went on a criuse to Iceland which just so happend to call in here at the Isle Of Man for the day, so we got to meet her and her friend, and took her for a grand tour of the Island. We are goin to England at the end of July and she is meeting up with us at my parents, so we shall see her again then. She is so sweet, love the colours! Love the little angel. Purple is such a wonderful colour. I adore peonies; they're among my very favourite flowers. Our peonies are all over now; I have to go out and 'deadhead the bushes one of these days. We have loads of them; my back yard is bordered by a peony hedge. Their so lovely. Meeting the long lost cousin must have been so special. very cool. Your purple angel is beautiful! Well, all three are lovely!! 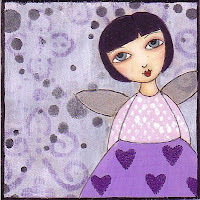 Love your purple angel, one of my favorite colors - in fact she is featured in a "lavender & lemon" mini on MY blog if you want to see! 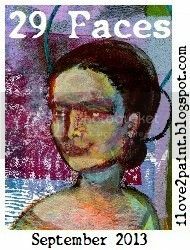 So glad to see a new painting from you, I really enjoy your art. I love that your new family member is wearing purple too! wow, what a neat story! So awesome that you were able to meet up again! Wonderful painting too! !